This is the time of the summer where all the new animal babies are being born or are about to be. We have several in our yard. We don't have a garden, so we don't mind these cute little bunnies. The baby birds are plentiful. The baby Tree Swallows are about to fledge. They are hanging out right at the edge of the birdhouse opening. Babies waiting for more food. A month or so ago I wrote about the Baltimore Orioles building a nest right off our deck. Now the eggs have hatched. I can't see the babies yet, but I can hear them. The parents are so busy going back and forth from the grape jelly to the nest to feed these babies. This link shows how the nest looked as it was being built. This is it today. It is pretty well camouflaged. It is hard to see from most angles, but the babies are so loud I can easily hear them. Male and Female Baltimore Orioles gathering jelly to feed their babies. The birds have to clean the jelly off their beaks regularly. 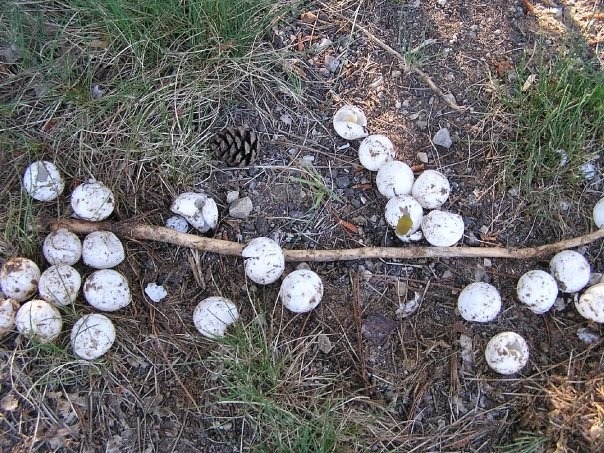 The turtle eggs won't hatch for a while but we have several areas in the yard where the turtles have laid some eggs. Very often the eggs are dug up by raccoons, but we put a barrier up to protect the snapping turtle eggs. Sometimes they choose the strangest places to lay eggs. Not very attractive, but keeps the eggs from being destroyed. I suppose our terrible lawn looks inviting and easy digging for these turtles. It's hard to imagine that these cute little critters can cause a lot of damage. We have baby ducks, baby turkeys, fawns and a number of baby birds. These birds left the nest right after I took this picture. I hope I didn't scare them out too early. It is fun to see how fast they grow and how quickly they are out in the cruel world to fend for themselves. They needed to leave the nest before they fell out.